Reminder: Popular Information is published Monday through Thursday. I’ll return to your inbox, bright and early, on Monday, August 6. 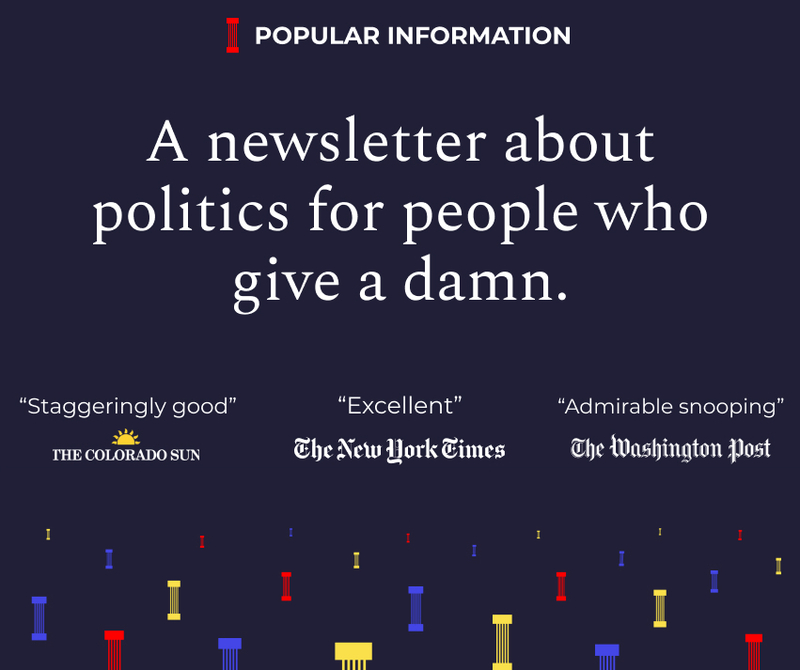 My friend Walt Hickey writes an excellent newsletter called Numlock that focuses on the numbers in the news. It's a quick read, and I learn something new from it every time. You can subscribe at numlock.substack.com. There are two major components of special counsel Robert Mueller’s investigation: 1. The possible conspiracy between the Trump campaign and Russia to influence the 2016 election, and 2. The possible obstruction of that investigation by Donald Trump. Trump should familiarize himself with 18 U.S.C. §§ 1503, 1505, and 1512. Obstruction of justice is a real and serious crime and has snared previous presidents. The first article of impeachment drafted against Richard Nixon was for obstruction of justice. Bill Clinton was impeached on December 19, 1998, for obstruction of justice. Why? It has to do with the underlying facts and the law. The core of the obstruction case lies in a conversation between Trump and former FBI director James Comey that occurred the next day. At that meeting, according to Comey, Trump cleared the room and asked Comey to end the FBI investigation of Flynn. “I hope you can see your way clear to letting this go, to letting Flynn go... He is a good guy. I hope you can let this go,” Trump said, according to Comey’s testimony and contemporaneous notes. Comey did not follow instructions. During a Congressional hearing on March 20, 2017, Comey confirmed there was an ongoing criminal investigation into a possible conspiracy between Russia and the Trump campaign. [The FBI] is investigating the Russian government's efforts to interfere in the 2016 presidential election and that includes investigating the nature of any links between individuals associated with the Trump campaign and the Russian government and whether there was any coordination between the campaign and Russia’s efforts… this will also include an assessment of whether any crimes were committed. According to press reports, later that month, Trump asked CIA Director Mike Pompeo and Director of National Intelligence Daniel Coats to intervene and ask Comey to back off the Russia probe. They refused. Trump also called Comey and asked him to announce publicly that he was not personally being investigated. Comey did not do so. On May 9, 2017, Trump fired Comey. The pretext for the firing was a memo written by Deputy Attorney General Rod Rosenstein. It argued Comey mishandled the Hillary Clinton email investigation. Two days later, Trump told NBC’s Lester Holt that he decided to fire Comey because Comey insisted on pursuing the Russia investigation. “[W]hen I decided to just do it, I said to myself, I said you know, this Russia thing with Trump and Russia is a made up story, it’s an excuse by the Democrats for having lost an election that they should have won,” Trump said. By that time, Attorney General Jeff Sessions had recused himself from the Russia investigation. Deputy Attorney General Rod Rosenstein then decided to refer the matter to a special counsel and appointed former FBI Director Robert Mueller, a lifelong Republican. Here, Trump openly admitted to firing Comey in an effort to end the Russia investigation, which was targeting his campaign. You can obstruct justice by impeding an investigation. It doesn’t matter whether the investigation uncovers any crimes. Mueller’s investigation, nevertheless, has already uncovered numerous crimes. Flynn, for example, pleaded guilty. There is no “fighting back” exception to the obstruction of justice statutes. This is where yesterday’s tweet comes in. Publicly calling on Sessions to end the investigation is more evidence of Trump’s “corrupt intent” in firing Comey. It’s showing that he’s motivated — then and now — to end the investigation into his campaign, his associates and himself. It suggests he wasn’t firing Comey for a legitimate purpose, like the job performance issues outlined in the Rosenstein memo, but an illegitimate purpose — to protect himself and his friends from legal peril. Trump’s lawyers, apparently sensing the legal issues with the tweet, quickly told reporters that Trump was merely expressing his “opinion” about the investigation. One person who doesn’t think it’s idiotic is Mueller, who reportedly is looking closely at Trump’s tweets as part of his obstruction investigation. Trump’s defenders say that firing Comey could not be obstruction of justice because Trump has the authority to fire anyone in his administration. But that is an oversimplification of the law. Just because you have the power to do something doesn’t mean it’s legal in all cases. A federal judge, for example, has the authority to rule for the plaintiff or the defendant in any given case. But it’s not legal for a judge to rule for the plaintiff because the plaintiff paid him $10,000. Here, Trump’s own words may constitute evidence of corrupt intent, potentially making an otherwise legal act illegal. Trump and Giuliani have floated the idea of pardoning key witnesses in the Russia investigation. Giuliani suggested that Trump would pardon Paul Manafort, Trump’s former campaign manager whose criminal trial started this week, after his bail was revoked in mid-June. Trump was slightly less explicit but certainly hinted that Manafort deserved a pardon in a tweet on Wednesday. While the pardon power is absolute, dangling pardons to entice witnesses not to testify is likely unconstitutional and may itself be obstruction of justice. It’s possible to infer intent from Trump’s public statements and tweets. They don’t look good. But the centrality of intent explains why Mueller is still interested in interviewing Trump. An interview would give Mueller a chance to question Trump directly about his intent. In such an interview, Trump would be boxed in by his previous public statements. He would be faced with the difficult decision of either confirming his previous statements or contradicting himself. It’s unclear if Trump has enough knowledge of the underlying legal issues to avoid incriminating himself. Paul Manafort, Trump’s former campaign manager, is on trial this week in Virginia. Prosecutors emphasize that Manafort used these funds to finance a lavish lifestyle, including over $1 million in designer clothing. The government posted photos of these clothes, which are something. You can find the rest of Manafort’s wardrobe here. Popular Information will return on Monday, August 6. If you can’t imagine that long without me, you can follow me on Twitter @juddlegum.